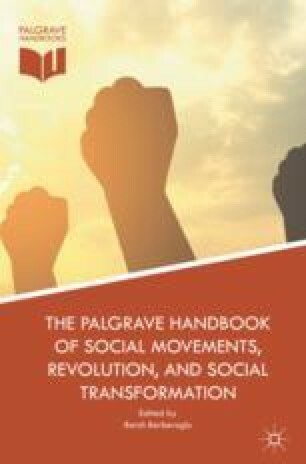 Social movements and revolutions are characterized as actions by excluded collectivities that use non-institutional strategies and tactics in sustained campaigns for social change. David A. Snow and Sarah Soule also define social movements as collective actions that either challenge or defend existing structures or systems of authority. It is important to address several assumptions that are often made in the social movement literature, especially when analyzing social movements in a global perspective. Most of the social movement literature focuses on exclusively modern movements that are characterized as “proactive” and ignores or dismisses the study of so-called reactive movements that were carried out by “primitive rebels.” This distinction implies that the peasant revolts and revolutions that were legitimated in religious terms are outside the domain of the field. Recent work on revolutions recognizes that popular revolts like modern political upheavals were already occurring in Bronze Age Egypt, and it is now claimed that collective behavior and rudimentary social movement-type activity are likely to have played an important role in social change since the Stone Age. Chase-Dunn, Christopher. 2016. Social Movements and Collective Behavior in Premodern Polities. IROWS Working Paper #110. http://irows.ucr.edu/papers/irows110/irows110.htm. Chase-Dunn, Christopher, and Ian Breckenridge-Jackson. 2013. The Network of Movements in the U.S. Social Forum Process: Comparing Atlanta 2007 with Detroit 2010. http://irows.ucr.edu/papers/irows71/irows71.htm. Chase-Dunn, Christopher, and Matheu Kaneshiro. 2009. Stability and Change in the Contours of Alliances Among Movements in the Social Forum Process. In Engaging Social Justice, ed. David Fasenfest. Leiden: Brill. http://irows.ucr.edu/papers/irows44/irows44.htm. Chase-Dunn, Christopher, and Bruce Lerro. 2014. Social Change: Globalization from the Stone Age to the Present. Boulder, CO: Paradigm. https://www.routledge.com/products/9781612053288. Chase-Dunn, Christopher, and R.E. Niemeyer. 2009. The World Revolution of 20xx. In Transnational Political Spaces, ed. Mathias Albert, Gesa Bluhm, Han Helmig, Andreas Leutzsch, and Jochen Walter. Frankfurt: Campus Verlag. http://irows.ucr.edu/papers/irows35/irows35.htm. Chase-Dunn, Christopher, and Ellen Reese. 2011. Global Party Formation in World Historical Perspective. In Global Party Formation, ed. Katarina Sehm-Patomaki and Marko Ulvila. London: Zed Books. http://irows.ucr.edu/papers/irows33/irows33.htm. Chase-Dunn, Christopher, Christine Petit, Richard Niemeyer, Robert A. Hanneman, and Ellen Reese. 2007. The Contours of Solidarity and Division Among Global Movements. International Journal of Peace Studies 12 (2): 1–15. http://irows.ucr.edu/papers/irows26/irows26.htm. Chase-Dunn, Christopher, Ellen Reese, Mark Herkenrath, Rebecca Giem, Erika Guttierrez, Linda Kim, and Christine Petit. 2008. North-South Contradictions and Bridges at the World Social Forum. In North and South In the World Political Economy, ed. Rafael Reuveny and William R. Thompson. Boston: Blackwell. http://www.irows.ucr.edu/papers/irows31/irows31.htm. Chase-Dunn, Christopher, Roy Kwon, Kirk Lawrence, and Hiroko Inoue. 2011. Last of the Hegemons: U.S. Decline and Global Governance. International Review of Modern Sociology 37 (1): 1–29. http://irows.ucr.edu/papers/irows65/irows65.htm. Chase-Dunn, Christopher, Joel Herrera, John Aldecoa, Ian Breckenridge-Jackson, and Nicolas Pascal. 2016. Anarchism in the Web of Transnational Social Movements. Presented at the annual meeting of the International Studies Association, Atlanta, March 16–19, IROWS Working Paper #104. http://irows.ucr.edu/papers/irows104/irows104.htm. Curran, Michaela, Elizabeth A.G. Schwarz, and Christopher Chase-Dunn. 2014. The Occupy Movement in California. In What Comes After Occupy? : The Regional Politics of Resistance, ed. Todd A. Comer. Cambridge Scholars Publishing. http://irows.ucr.edu/papers/irows74/irows74.htm. Denemark, Robert. 2008. Fundamentalisms as Global Social Movements. Globalizations 5 (4): 571–582. GDELT Project http://gdeltproject.org/. Freeman, Jo. 1970. The Tyranny of Structuralessness. http://www.jofreeman.com/joreen/tyranny.htm. Grimes, Peter E. 1999. The Horsemen and the Killing Fields: The Final Contradiction of Capitalism. In Ecolog and the World-System, ed. Walter L. Goldfrank, David Goodman, and Andrew Szasz. Westport, CT: Greenwood Press. http://irows.ucr.edu/grimes/horsemen.htm. Leetaru, Kalev. 2014. Did the Arab Spring Really Spark a Wave of Global Protests? Foreign Policy. May 30. http://foreignpolicy.com/2014/05/30/did-the-arab-spring-really-spark a-wave-of-global-protests/?wp_login_redirect=0. Milkman, Ruth, Stephanie Luce, and Penny Lewis. 2013. Changing the Subject: A Bottom-Up Account of Occupy Wall Street in New York City. CUNY: The Murphy Institute. http://sps.cuny.edu/filestore/1/5/7/1_a05051d2117901d/1571_92f562221b8041e.pdf. Sen, Jai, and Madhuresh Kumar with Patrick Bond and Peter Waterman. 2007. A Political Programme for the World Social Forum? Democracy, Substance and Debate in the Bamako Appeal and the Global Justice Movements. Durban, South Africa: Indian Institute for Critical Action: Centre in Movement (CACIM), New Delhi, India & the University of KwaZulu-Natal Centre for Civil Society (CCS). http://www.cacim.net/book/home.html. ———. 2007. The World Social Forum: From Defense to Offense. http://www.sociologistswithoutborders.org/documents/WallersteinCommentary.pdf. Waterman, Peter. 2006. Toward a Global Labor Charter Movement? http://wsfworkshop.openspaceforum.net/twiki/tiki-read_article.php?articleId=6.